This set is such a great value! These are being sold for $20-$30 each on many sites and this set from Amazon is the exact same product/quality but FIVE for $30! Click here for my facial massage review/demo. This roller really gets my circulation going and my skin glowing. I love that you don’t need a face oil and can use it on bare skin, throughout the day or over makeup/skincare. Another great version of a popular beauty tool that works just as well ($28 vs the one by a celeb dermatologist for $69). Also this is a cuter color than the purple one IMO and even comes with a little travel pouch. I use this small vibrating massage bar around my eyes and it helps eye cream absorb and get rid of puffiness/dark circles. Another product that sells for $80 but this $10 version is just as good! This might look weird if you haven’t tried it but if you’re still using a flat foundation brush or beauty blender all the time you are missing out! This is the fastest/easiest way to apply & blend face color, period. 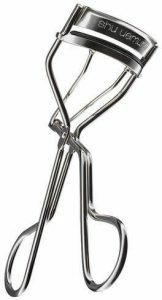 My #1 beauty tool for when I’m wearing makeup or not is probably a great eyelash curler. This one by Shu Uemura is a cult fav and my personal favorite! It gets in close to your lash line and never pinches. Also I feel like it helps my lashes hold the curl better than other curlers.